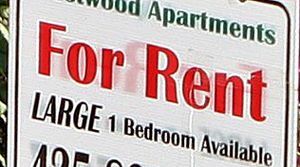 A “For rent” sign in Seattle. The law, which took effect in January, limits deposits and nonrefundable move-in fees to one month’s rent, and allows renters to pay the costs over six months. A landlord group is suing the city of Seattle in hopes of reversing a new law that allows renters to pay smaller move-in fees and pay their deposit in installments. The City Council in December voted unanimously to cap move-in fees at apartments and other rentals, hoping to bring relief to tenants already dealing with rising rents. With rent control illegal in Washington, some council members thought the next best thing was to lower tenants’ other costs. The law limits deposits and nonrefundable fees to one month’s rent and pet fees to an additional one-fourth of monthly rent, and allows those costs to be paid over six months. But since the changes went into effect in January, landlords say their inability to collect more money up front has left them taking on more risk. Some have reacted by raising rents or increasing the credit-score requirements for applicants. Their attorneys argue that the limits conflict with the state’s ban on rent control, violate their free speech and due process rights, and amount to an illegal taking of private property under the state constitution, Martin said. The landlord group says the law is part of a pattern by city officials to restrict landlords’ rights. Some landlords in March sued over a newly approved law requiring property owners to accept the first qualified tenant that submits an application for open apartments, though that change hasn’t gone into effect yet. The city also recently created the nation’s first renters’ commission, designed to come up with pro-renter laws. Sean Flynn, the rental-housing association’s president, said the laws probably don’t affect huge property owners with thousands of units much. But his membership of smaller landlords doesn’t know how to navigate the bureaucracy, and some have reacted by selling their properties. Pending the actual filing of the landlords’ suit, the city’s legal team had no response other than to say it would vigorously defend the law. Councilmember Kshama Sawant proposed the move-in fee limits last July after hearing from renters who were struggling to come up with enough money to afford to move. The one-time costs that come with moving can keep renters from leaving their current apartments, even when rents go up. It can cost several thousand dollars just to sign a lease, between first and last months’ rent, security deposit, pet deposit, background check and other fees. Even as rent hikes have slowed in other pricey cities, the Seattle region remains among the worst in the country for increases lately. Rents citywide have shot up more than 40 percent in the last five years. But Flynn argues the move-in cap and other regulations by the City Council only hurt the mom-and-pop landlords who provide most of the older, more affordable apartments in the city. When landlords get so fed up that they sell, their properties could be wiped out and turned into shiny new expensive housing, he said.